In 1993, Irish President Mary Robinson unveiled both statues. The commemorative statues now serve as symbols of the permanent union between Ireland and the United States. 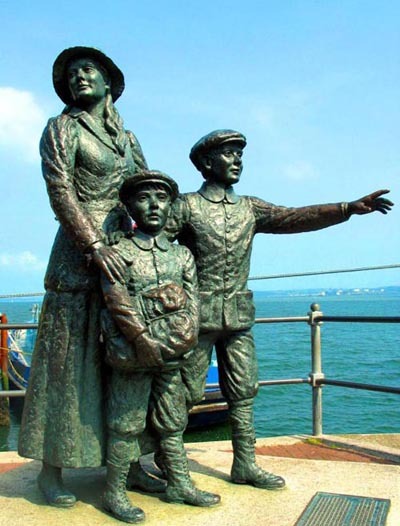 Additionally, the Annie Moore statue stands as a symbol for immigrants of all nations that have contributed to the rich fabric of the United States. Annie was born in Cork in 1877. Her parents emigrated to America in 1890 and left Annie and her two brothers in the care of an aunt. When they were established in America they sent for the children who departed on the ship "Nevada" in December 1891. They arrived 12 days later on January 1st 1892 and Annie was first off the ship where she was greeted by various officials in recognition of her being the first person whose immigration was processed in the new centre on Ellis Island. To read more about Annie's travels, click here. Annually the Annie Moore Award is presented at the IACI’s Washington’s St. Patrick’s Day Ball. The award is bestowed to an individual who has made significant contributions to the Irish and/or Irish American community and legacy. Washington's Irish Ball (February 26) Every year, the IACI commemorates the unique historical moment when General George Washington issued an official proclamation in recognition of St. Patrick’s Day to his troops. To learn more, click here.